August 2002: August rain moves in from Opabin Pass toward pewter-toned Opabin Lake. 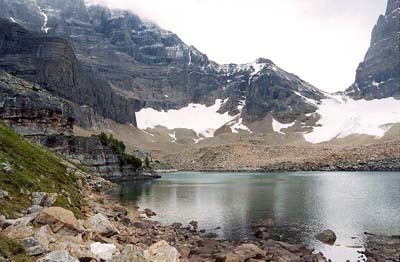 Opabin Lake is at the high end of the plateau and the end of the plateau's network of trails. Opabin Pass, above the Opabin Glacier, is between Hungabee Mountain (L), 349 2 m, and Mount Biddle (R), 3319 m.